Fredrica Christina Peterson, the second daughter of Peter Fredrikson and Brita Carolina Svensdotter, was born March 3, 1828 in Vimmerby, Kalmar, Sweden. 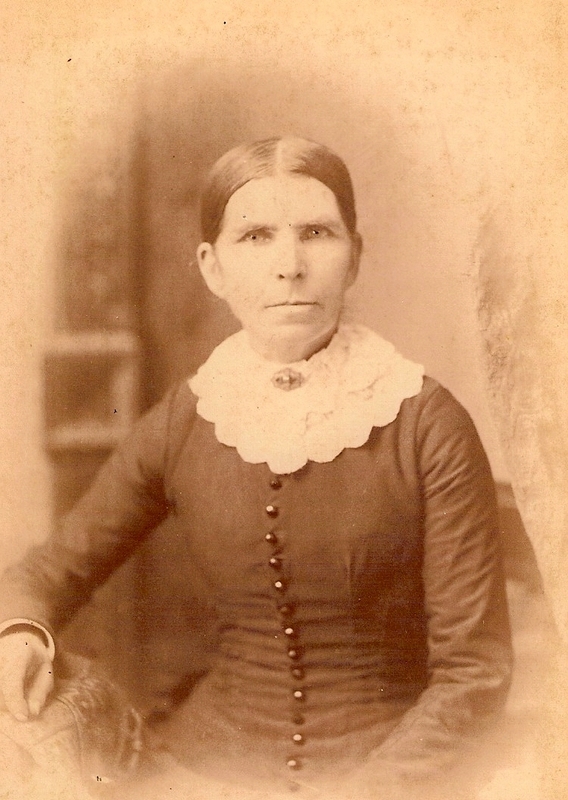 Her older sister is Anna Stina Petersdotter who was born March 3, 1826. On December 29, 1849, she married Carl Johan Gardman by pastor A. Lindal in Vimmerby, Kalmar, Sweden. The men in Carl's father were military man who served many years in the Swedish Army. The King of Sweden, wishing to reward one of his ancestors for valiant service, changed his name from Johnson to Gardman. After their first daughter, Christine Caroline, was born, the couple left Kalmar, the garden county of Sweden, for New York. My mother, Betty Louise Gentry, corresponded with their Grandson, Charles Gorman in Laddonia, Missouri. He is my great grandfather Edward Earl Gates' Cousin. I pieced this story together from items sent to Mom by Charles Gorman who must have been named after his Grandfather. Charles Gorman was born Carl Johan Gardman, June 18, 1824 in Malilla, Kalmar, Sweden to Jonas Peter Gardman and Christina Sophia Hellgren. Charles and Fredrica settled in Chautauqua County, western New York, where Augusta, Levi, Martin, Frank, Albert, Emma, and Ellen, were born. About 1861, when Charles was 37, they left Lake Chautauqua for a farm he bought in Laddonia, Audrain County, Missouri. The Civil War broke out, so it appears Charles went back to New York, and enlisted at Mayville with his friends in Company H, 112th Regiment of the Regiment of Infantry Volunteers of New York, on August 30, 1862. He followed in his ancestor’s footsteps, becoming a military man. Charles was in Suffolk, Virginia in 1863, then Fortress Manor, Virginia in June of 1864 soon after the "Battle of Cold Harbor." He was present at the different battles around Petersburg, Virginia. He was discharged at Buffalo, New York, July 3, 1865. (Mary and Fanny were born in Missouri after the war). When Charles left for the war, Fredrica had eight children to raise and a farm to run. She taught the native women to bake light bread, they only knew how to bake biscuits. She also taught them to make corn pone. Fredrica sent one of her daughters, Ellen, at the age of ten, to live with a family in Mexico, Missouri, 20 miles from Laddonia. They all had their picture taken at Graham studios before the war. For some reason, no one went to get her back. She worked hard, and by the time she finished high school and college, her health wasn't very good. Ellen married Mr. Charles Wheeler. It was a struggle to feed so many mouths as the children came along, and Mrs. Wheeler also lived with them. It is said they were as poor as "Job's turkey." The record mentions an Aunt May coming through to visit on her way to Laddonia and asked to take Ellen's oldest daughter who was five, with her. She had a wonderful time. Her Uncle Frank and Uncle Levi took her with them everywhere they went, hand in hand. They went to town every day to pick up the mail, they fed the hogs, and milked the cows. She couldn't talk enough about them when she returned. I received your letter dated May 29th. Was glad to hear that you and the rest of my family ware injoying good health. My health is very good—much better than could be expected under the present circumstance. It is nearly six weeks a go that we started on the present campaign and I do not think that we have one nights wrest since that time. We had a pretty severe ingagement the other day. It was the hardest that I had been in since I had ben in the sirves, but thank God I came out safe. The regiment lost pretty severely in cilld and wonded. One hundred fifty eight kild, wonded, and missing. Amonste them our commander, Cornel Drake. He was wonded on the battle field and since died. Your father wishes you to read the letters to your mother for he can not get eney one to write Swede for him for the Swede boys that were in the reg't are cild or wonded. I have not much time to tell you at this time only that the ware may come to a speedey close and that I may be prmeted to return home agin. Please write as often as convenent. I, Adolf F. Gorman, being duly sworn do say upon oath that I am a resident of Webster county, Iowa. That my Post Office address is Gowrie, Webster County, Iowa. That I am 57 years of age, that I was born in Sweden and that I am a brother of Charles Gorman, late a private of Company H, 112 Regiment, New York Volunteers. That my brother died in May 1897, in Laddonia, Missouri. I further certify that my said brother, Charles Gorman and Fredrica Peterson were married in Vimmerby, Sweden, in the year AD 1850 and that I was present at the time of their marriage and that neither one of the parties had been previously married and that they lived together as man and wife until his death. I further certify that my Sister-In-Law, Mrs. Charles Gorman, has not remarried since the said Charles Gorman's death. This was witnessed on September 18th, 1897. Fredrica died December 2, 1917 in Laddonia, Missouri. I, Naomi, visited Laddonia in 1976 and saw the flat, rich fields meant for growing corn. There was a lake, but the picture I took didn't do it justice. It was just a moment in time, but I was forever connected to a piece of my history and kindred--the Gorman family. I came home to Provo, Utah, and hired a genealogist to search for the family in Sweden and she found them back into the 1730's in the Kalmar Lan or county of Sweden. Charles Gorman was born Carl Johan Gardman. His daughter August Gorman is Grandad Edward Earl Gates (Ed Yates) mother. Grandad couldn't say enough good about his mother. A picture of her hung on his bedroom wall all the time I knew him. He died May 11, 1980 at 96. I found the following ancestors of Fredrica Christina Peterson at the Family History Center in Salt Lake City during the summer of 2006. These are the ancestors of Augusta Gorman, Edward Earl Gates wife. (The histories were translated from the original texts by Margarita Choquette at the Family History Center in Salt Lake City, Utah). Wathier De Besche is the first known De Besche. He was alive in 1397 and was of Dutch nobility. He lived at Liege, Belgium. His wife was Johanna De Borne. His son was named Henrik. Henrik was alive in 1448 and was married to Maria Montage. His son was also named Henrik and was alive in 1488. His wife's name was Johanna De Roxelle. Their son, Vilhelm De Besche, was an architect for the elector of Koln. Vilhelm died October 8, 1567. He's buried in St. Lambert's Church. I don't know yet where that is. Vilhelm's son was Gillis De Besche. He was born August 24, 1548 in Liege, Belgium. He was living in 1606 in Nykoping, Ostergotland, Sweden. He was married to Helena De Besche, a relative, also born in Liege, Belgium. We are descended through Gillis' third son, Hubert De Besche who was born in 1582. Hubert studied architecture and mining. He was an architect and merchant. He was made a nobleman by Kaiser Fredrick III. Hubert was called by King Carl the 9th from Liege, Belgium to Sweden. He went into business with Louis de Geer. They built foundaries and made the best steel in Europe. Their process burned off more sulpher, so it was highly regarded and sought after. Hubert owned a factory where they made canons. He was the contractor who built Grupsholm, a big castle. In Dec of 1609, he was building the German Church tower in Stockholm. In 1613-1618, he was the contractor who built the Stockholm Castle. He had a special privilege. He didn't have to pay customs. He was a contractor at the harbor of Stockholm and built Nykoping Castle in Ostergotland, Sweden. Hubert is buried at Tuna Church in Sodermanland. His gravestone has the coast of arms with three fish. He was married to Maria Rochet from Languedoc, France. She's buried under the same stone as her husband. We are descended through their son, Gillis De Besche, who was born, July 26, 1624 in Guldsmedshyttan, Lindesbergs, Orebro, Sweden. Guldsmedshyttan translated means, goldsmith's hut. That can't be bad. He was naturalized in 1692 and was a Lord of Works. Gillis was the wealthiest plant owner in Sweden at the time. He died August 1, 1709 in Tunaberg, Sodermanland and is buried in St. Nicolai Church in Nykorping, Ostergotland, Sweden. His wife was Christina Moller. Their son Isak De Besche, was born February 26, 1663 in Navekvarn, Bjorkviks, Sodermanland, Sweden. He owned a big manor. Isak died April 10, 1719 in Nykoping, Ostergotland, Sweden and is also buried at St. Nicholai Church, Nykoping, Ostergotland, Sweden. His wife was Christina Sabina von Berchner, his step-mother's sister's daughter. They had seven children. Our ancestor is Gerard Georg De Besche, born March 12, 1702 in Ottinge, Lofta, Kalmar, Sweden, his wife was Maria Christina Ehrenkrona. Their daughter Ulrica Juliana De Besche, married Lieutenant General Carl Henrich Klingspor, the highest ranking officer in the Kalmar, Sweden Regiment. There was a Knight in the 1200s in Livland (Ancient Estonia and Latvia) mentioned in medieval transactions in Holstein and Hamburg northern Germany. The first Klingspor we have record of is Stafan Hermansson von Klingspor, who lived in 1460. His coat of arms was a black wild boar on a field of red. His wife was Brigitta von Donhoff. His son was Mattias von Klingspor from Klingsporhof later of Probstinghof, Uexkulls, Riga, Latvia, who was a councilor in Poland and was alive in March of 1536. He died August 22, 1538. His wife was Margareta von Bergen. Mattias' son was Stefan von Klingspor from Klingsporhof in Ambotten, Riga, Latvia. He was alive in 1563. His son, Johan von Klingspor was of Bandimirshof and came to Sweden in 1563 as a Page for Catharina Jagellonica, the Polish Princess, daughter of Adolph Gustav II. Stafan's son was Johan von Klingspor, born in 1578 in Livland or the current Estonia/Latvia. He is buried at Vallentuna church outside Stockholm. He was married to Margareta von Buddenbrock. Their son and our ancestor was Major General Staffan Klingspor, born August 26, 1611 in Uppsala, Sweden. This was either the beginning or continuation of a very high-born military family. Major General Staffan Klingspor became a naturalized Swede in 1633. He conquered Lund which is the southern strip of what is now Sweden, but was once shared with Denmark. He was in the Polish war in 1650. He was distinguished by extraordinary bravery. Ballsta, a large farm or manor came to him along with Wolslava, a village in Ingermanland county, where Petersburg is now in Russia. He was buried with great pomp at Ridderholm Church, in Vallentuna, an island off Stockholm. Here there are 16 coat of arms of our ancestors. He was buried in an expensive copper coffin. In 1855, his coffin was opened and he was still perfectly preserved. He was wrapped in white silk and black velvet and wore a silver ring. Staffan's son, Christian Ludvig Klingspor is our ancestor. Christian Ludvig was born Sept 1, 1657 in Uppsala, Sweden, and died January 2, 1699 in Jonkoping, Ostergotland, Sweden. He is buried in Bankeryds Church in Jonkoping. His wife was Henrica de Moucheron whose father was a court chancellor. The de Moucheron family originated at Castle Boulay in Normandy, France. Their son and our ancestor, is Staffan Klingspor, born May 1, 1690. He died July 25, 1766 in Lidhem, Locknevi, Sweden where his coat of arms hangs. He was wounded in the Battle of Halsingborg. He was married to Ursula Christina von Stegling. Their son was Lieutenant General Carl Henrich Klingspor. He was born January 9, 1715 in Askeryd, Askeryd, Sweden. He died in Vimmerby, Kalmar, Sweden in 1774. Carl Henrich was married to Ulrica Juliana De Besche. He Was the highest ranking officer in the Kalmar Regiment. We are descended through their son, Lieutenant Fredrick Wilhelm Klingspor who was born August 3, 1769 in Winketomta, a large manor near Vimmerby, in Kalmar County, on the south east coast of Sweden. He married about 1797 to Stina Mansdotter. We are descended through their son, Peter Aberg Fredrickson who was born August 16, 1798 in Grinderum, Frodinge, Kalmar, Sweden. Peter Fredrickson died April 22 1834 at Winketomte. He married Brita Carolina Svensdotter, December 10, 1825. She was born March 13, 1804 in Vimmerby, Kalmar, Sweden. Peter and Brita's daughter, is our Fredrica Christina Peterson, born March 3, 1828 in Vimmerby, Kalmar, Sweden. Fredrica Christina, married Charles Gorman and immigrated to the United States where she died on December 2, 1917 in Laddonia, Audrain, Missouri.